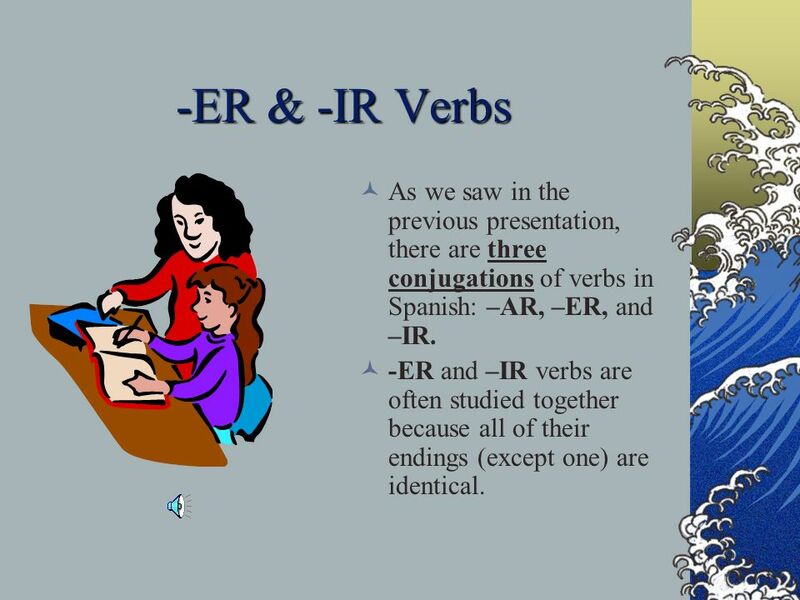 1 -ER & -IR Verbs As we saw in the previous presentation, there are three conjugations of verbs in Spanish: –AR, –ER, and –IR. 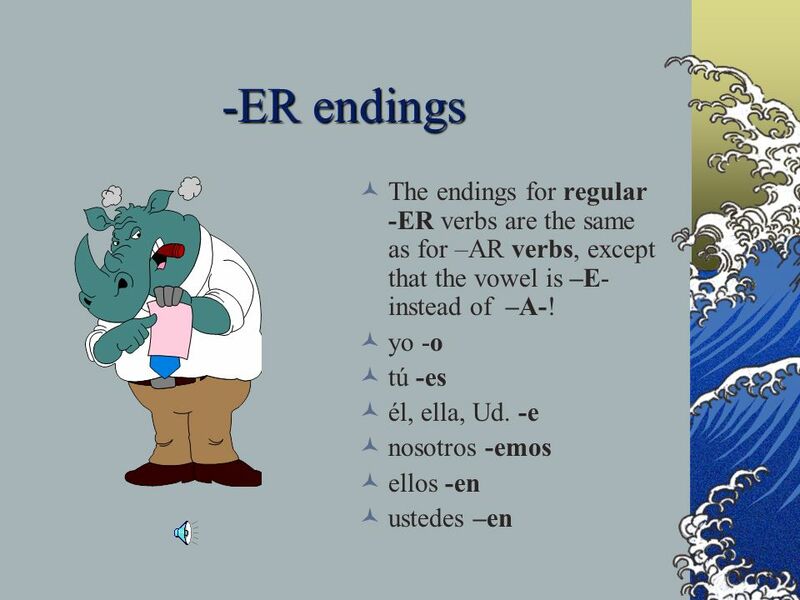 -ER and –IR verbs are often studied together because all of their endings (except one) are identical. 2 BEBER Let’s look at an example, the verb BEBER, which means “to drink.” It ends in –ER, so it is included in this class. When you talk about yourself, add –O, just as you did for the –AR verbs. 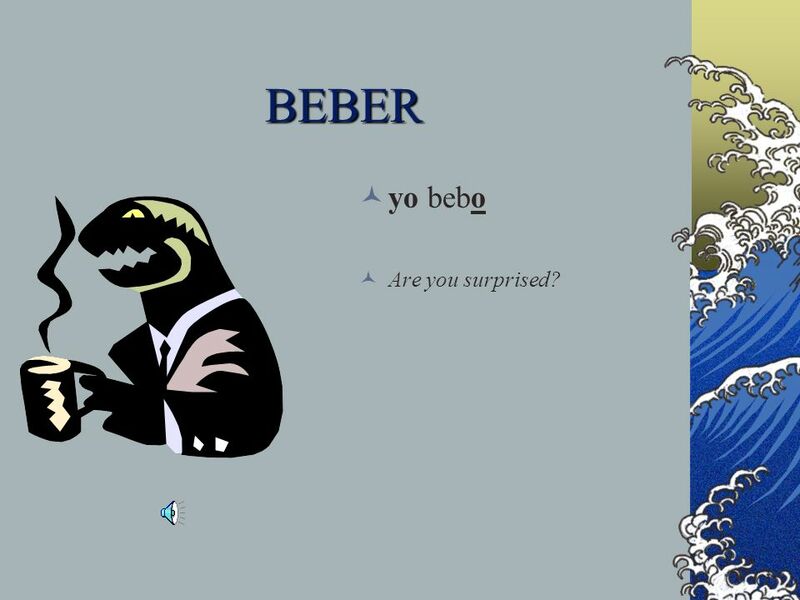 5 BEBER yo bebo Are you surprised? 6 BEBER Now let’s talk about you. 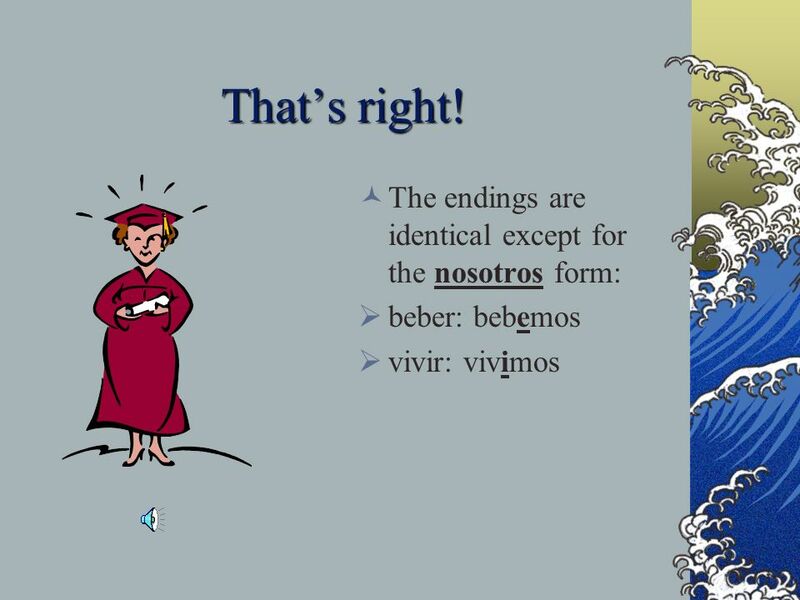 When the subject is tú, you add –ES (remember that it’s an –ER verb). 8 BEBER Let’s guess endings for the other persons: él, ella, Ud., nosotros, ellos, ellas, Uds. 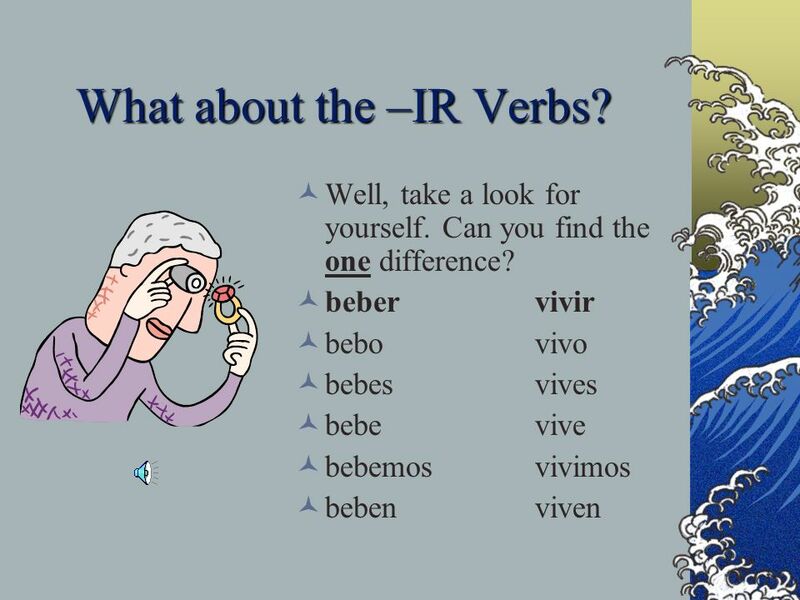 11 What about the –IR Verbs? 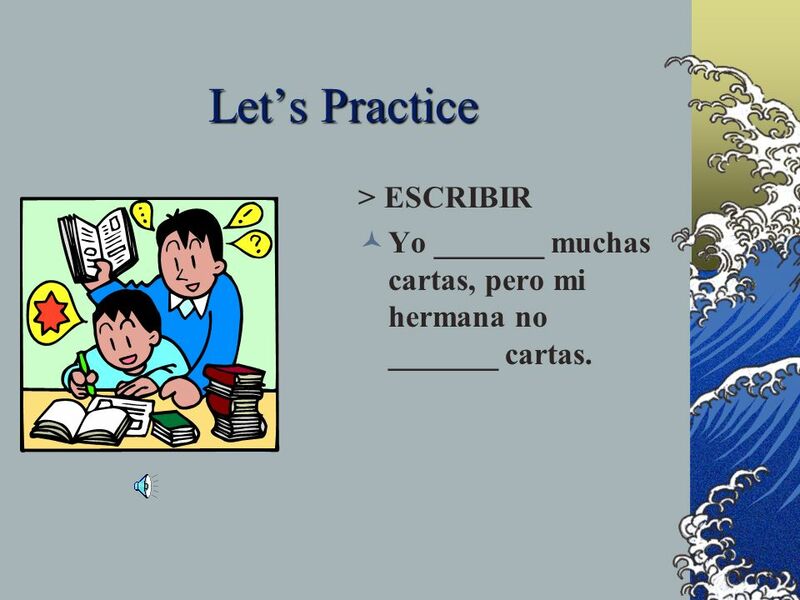 Yo _______ muchas cartas, pero mi hermana no _______ cartas. 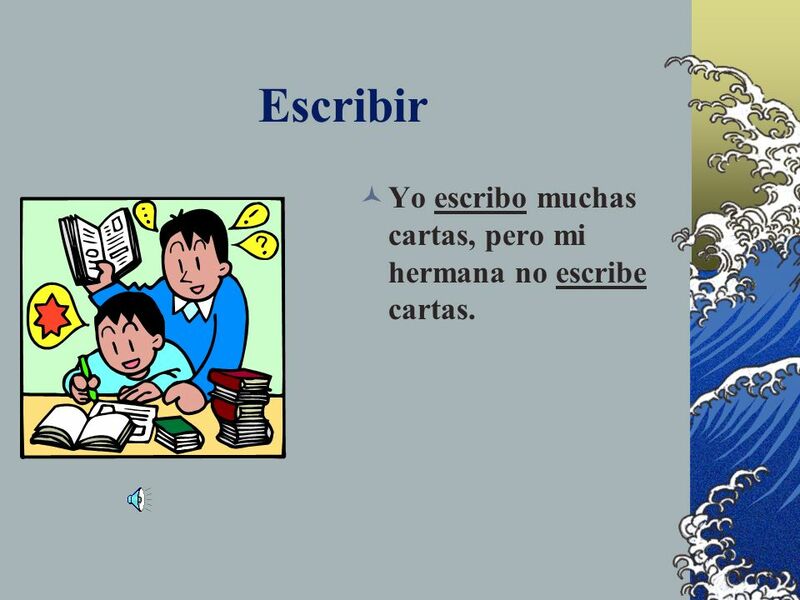 14 Escribir Yo escribo muchas cartas, pero mi hermana no escribe cartas. 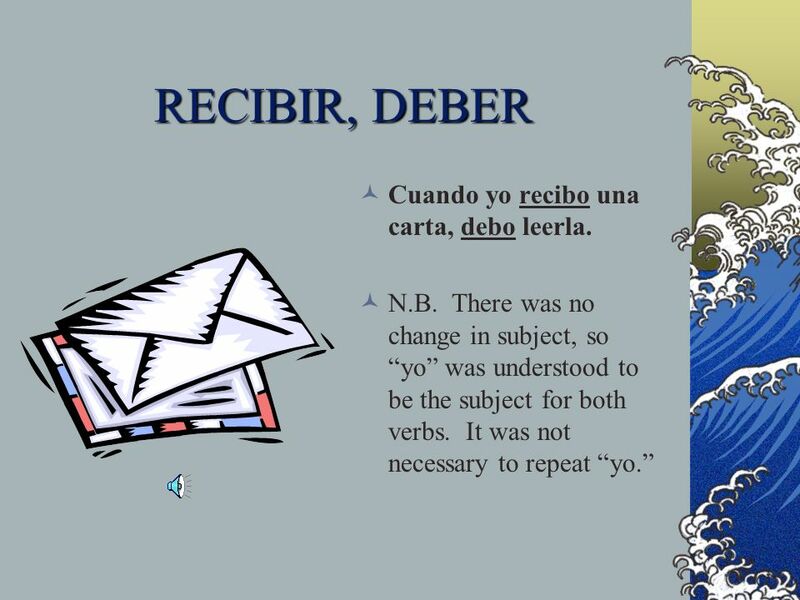 15 RECIBIR, DEBER Cuando yo _______ (recibir) una carta, _______ (deber) leerla [read it]. 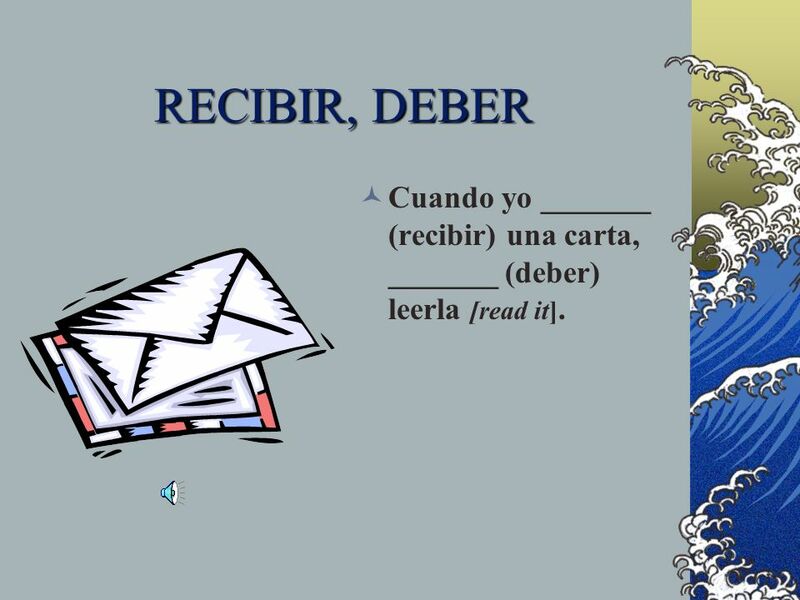 16 RECIBIR, DEBER Cuando yo recibo una carta, debo leerla. 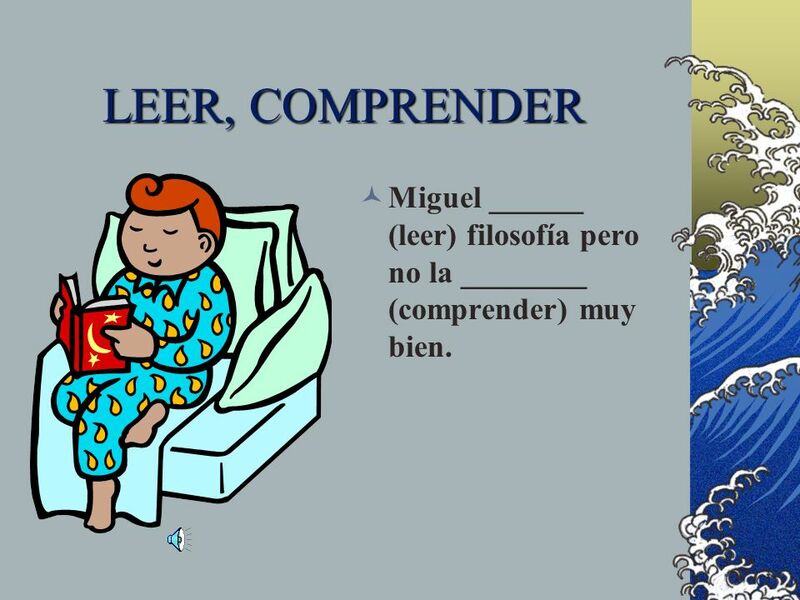 17 LEER, COMPRENDER Miguel ______ (leer) filosofía pero no la ________ (comprender) muy bien. 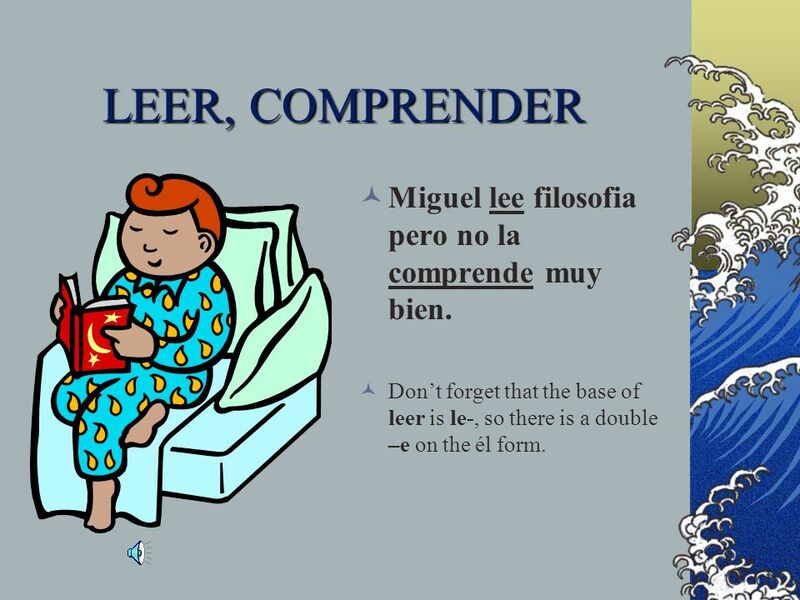 18 LEER, COMPRENDER Miguel lee filosofia pero no la comprende muy bien. 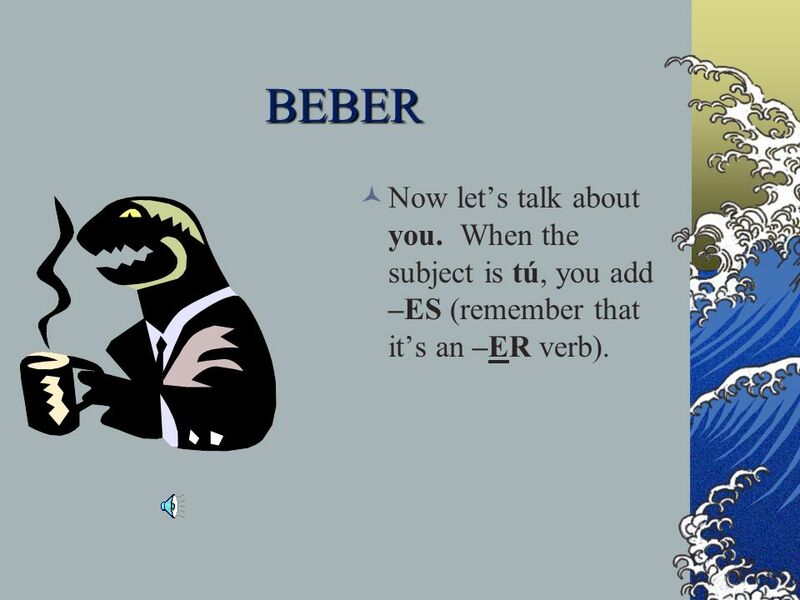 Don’t forget that the base of leer is le-, so there is a double –e on the él form. 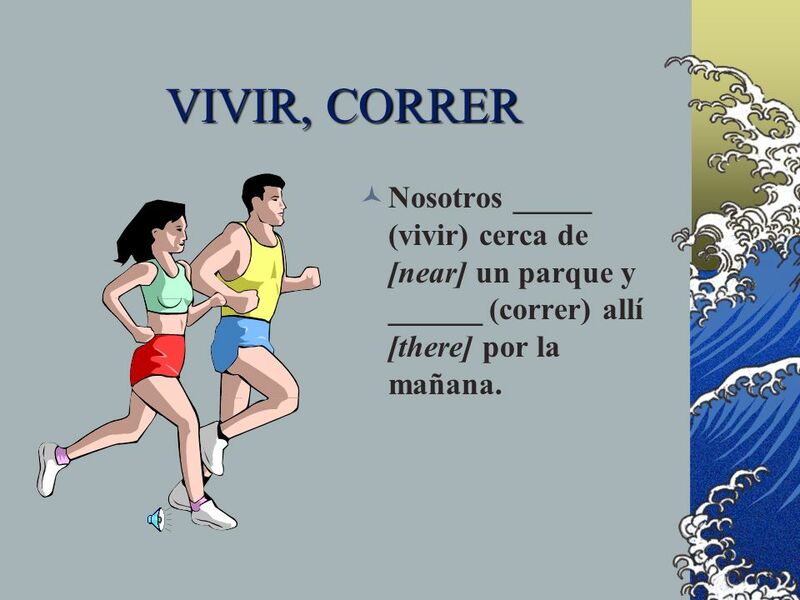 19 VIVIR, CORRER Nosotros _____ (vivir) cerca de [near] un parque y ______ (correr) allí [there] por la mañana. 20 VIVIR, CORRER Nosotros vivimos cerca de un parque y corremos allí por la mañana. 22 Regular Present Tense Now let’s look at verbs that don’t fit these neat patterns! 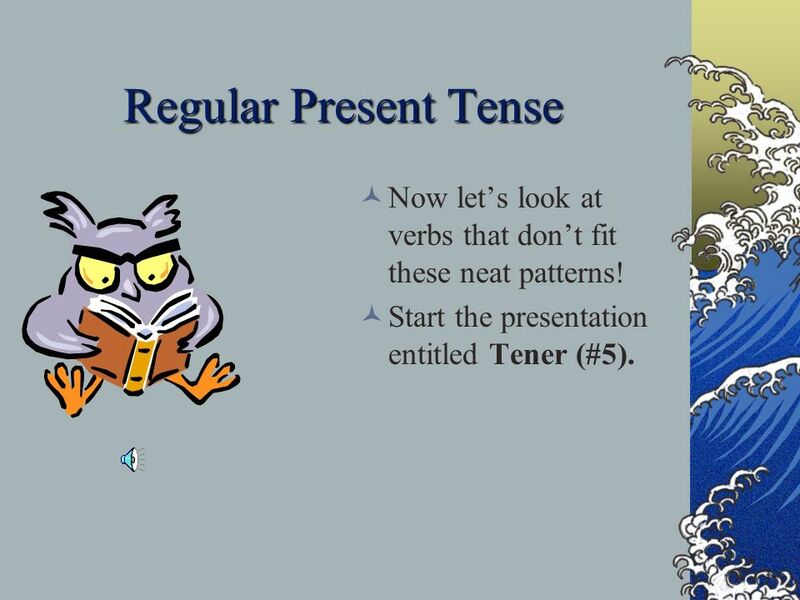 Start the presentation entitled Tener (#5). 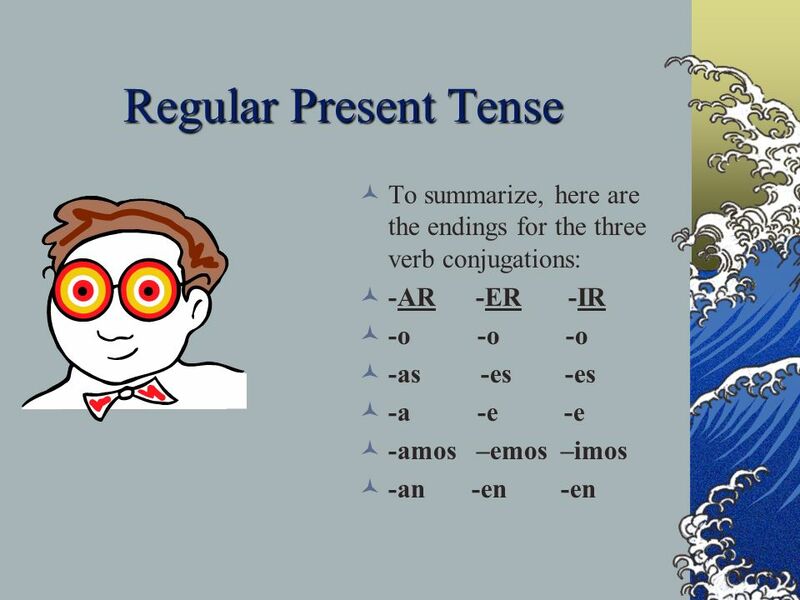 Descargar ppt "-ER & -IR Verbs As we saw in the previous presentation, there are three conjugations of verbs in Spanish: –AR, –ER, and –IR. -ER and –IR verbs are often."